Jan van Goyen was one of the pioneers of "tonal" painting, which brought a new colouristic and atmospheric unity to landscape and thereby achieved a new standard of naturalism. Born in Leiden and trained by, among others, Esaias van de Velde (c. 1590-1630), Van Goyen is reported to have travelled to France in his youth but spent most of life in his native country save for excursions documented in his drawings to the Southern Netherlands, Westphalia, and Cleves. His first manner employed the colourful and additive approach to composition favoured by his teacher, Van de Velde, but he began to explore greater unification of space in his drawings from the early 1620s and made his most significant breakthroughs in "tonal" landscape painting in his hometown in 1625-1627. Van Goyen was preceded in these experiments by his acquaintance, the seascapist Jan Porcellis (c. 1584-1632), and two very capable but lesser-known landscape painters, Pieter van Santvoort (1604/05-1635) and Pieter de Molijn (1595-1661). However the two artists who first truly codified the "tonal" style were Jan van Goyen and Salomon van Ruysdael (1600/03-1670), painting simple scenes of dunes, rivers and canals with a restrained palette of browns, tans and greens and a heightened appreciation of atmospheric effects. Between 1626 and 1629, Van Goyen systematically reduced the number of motifs in his designs, increasingly employed diagonal compositions, and sought an unifying colour scheme of earth colours and effects of moist air. 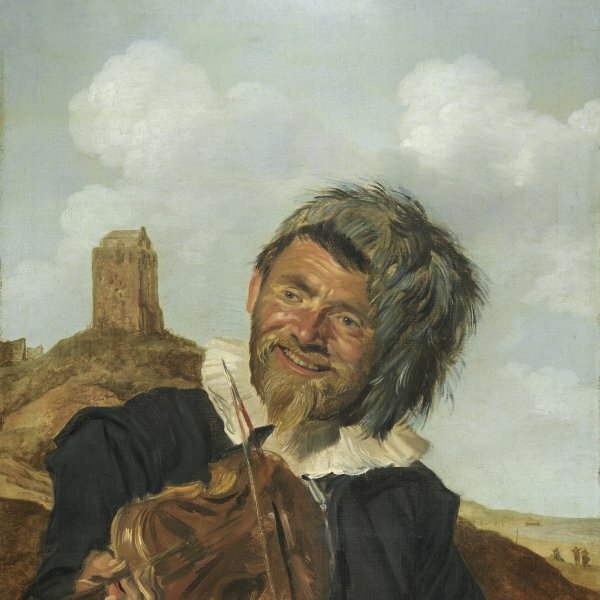 The present painting is a characteristic example of the master's mature "tonal" manner. With its depiction of a crude rural cottage covered with thatch in a loamy landscape dappled with shadow, apportioned by a few tumbledown fences and peopled by clots of desultory peasants, it is typical of this unpretentious art. Like Molijn before him, Van Goyen employs a powerful band of shadow in the immediate foreground to throw the lighted cottage and trees in the middle ground in sharp spatial relief. Note particularly his interest in the irregular shapes of the fence and overturned wheelbarrow on the edge of the darkened rise in the centre and how he silhouettes figures on the hill at the left. 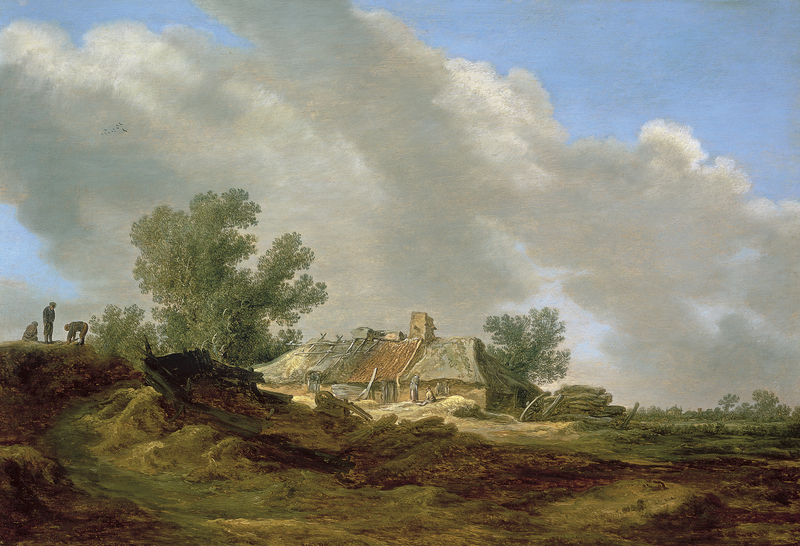 Van Goyen dated at least seven other dune landscapes with roads and cottages in 1629. Especially close in design to the present work is the dunescape with lighted cottage dated one year earlier, 1628, formerly with the dealer Ehrhardt & Co., Berlin, 1929; compare also the design of the landscape dated 1629 in the Alte Pinakothek, Munich, no. 6398. The silhouetted figures on the hilltop recur regularly in Van Goyen's works from these years.